Hand Spray is the most versatile and popular production technique and the one normally chosen by new start-ups. 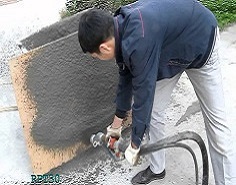 A special spray gun is used to simultaneously deposit chopped glass fibre and cementitious slurry onto a mould. 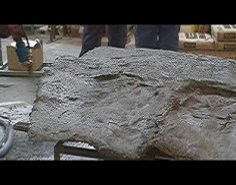 This is then compacted by hand using a spring roller. A second layer is then sprayed and again compacted. Using the spray technique allows high glass percentages to be used and this gives the highest mechanical properties. In turn this allows for reduced skin thickness and lighter products. The hand spray process can be automated or semi-automated. More common are semi-automatic processes where the spray gun is mounted on a reciprocating traverse with the moulds passing underneath on a conveyor. Compaction can be by hand or via a dewatering system. These systems are ideal for the production of flat products and they can also be very versatile when used with folding moulds. 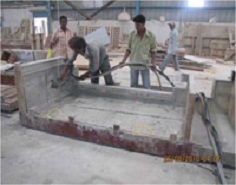 As the name suggests the glass fibre is mixed into the cementitious slurry and the resulting material is poured or pumped into moulds and compacted using vibration or by using special additives in the mix. The premix process can be easily automated and is often chosen for standard product manufacture. The moulds used are more complex than those for the spray process. The mechanical properties are lower but they are consistent allowing optimum design. 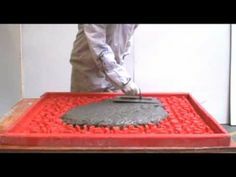 This is a combination method where the premixed material is sprayed onto the mould. It combines the advantages of both methods and isbecoming the method of choice for many small architectural items.